As if things weren’t already bad enough for the Seattle Mariners, things may be about to get worse. On Friday, the Mariners added left-handed starter James Paxton to the 10-day DL with a forearm strain. The team has labeled it a Grade 1 strain, making them hopeful that this will be a minor issue that only keeps Paxton out for a couple of starts. 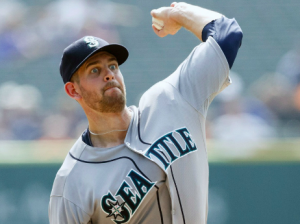 However, Paxton has been Seattle’s ace through the first month of the season and one of the best pitchers in all of baseball, so any amount of time he misses is a big deal for the Mariners, who are still struggling to catch their footing this year. Paxton last pitched on Tuesday, going 5.1 innings and allowing just two runs against the Angels. Through six starts this season, Paxton has an ERA of 1.43. In four of his six starts this year, Paxton has held his opponent without a run, showcasing his dominance this season and how important he has been to the Mariners. Unfortunately for the Mariners, Paxton joins Felix Hernandez and Drew Smyly on the DL. Smyly is yet to pitch at all this season because of an elbow injury and has not yet started to throw on the road back from injury. Hernandez, meanwhile, is battling shoulder bursitis and isn’t expected to return until at least the early part of June. With Paxton joining them on the DL, the Mariners are now without arguably their three most talented starters. With Paxton, Hernandez, and Smyly sidelined all at the same time, the Mariners will be forced to learn on Hisashi Iwakuma and Ariel Miranda. Iwakuma has been a little up and down this year and is doesn’t appear capable of being a defacto ace at this point in his career. Miranda, meanwhile, may actually Seattle’s best starter outside of Paxton this year, despite only starting the season in the rotation because of the injury to Smyly. Miranda is 3-2 with a 3.55 ERA, and the lefty will now have to fill a prominent role in Seattle’s rotation for the time being. Unfortunately, the rest of Seattle’s rotation is in rough shape at the moment. Yovani Gallardo has not bounced back from a poor 2016 season the way the Mariners were hoping and has been little more than an innings eater. Chase De Jong gave up six runs in 2.2 innings last weekend, but the Mariners may have to keep him in the rotation for the time being. Dillon Overton, who has struggled pitching out of the bullpen this year, may be in line to take Paxton’s spot in the rotation. Despite a poor record at the end of April, Dipoto expressed his confidence that the Mariners would right the ship in the weeks to come. However, with Paxton set to miss time with Hernandez and Smyly already on the DL, injuries to the starting rotation may be too much for the Mariners to overcome. Paxton had taken over the role of ace and was helping to hold Seattle’s rotation together. Even if he only misses a couple starts, losing Paxton for any period of time is not something the Mariners can afford.